Oh, where to start? How about with the idea that “the process to increase the pay and replace a director began last September”? That’s an interesting timeline he provides. Mainly because Glass did not become chairman until October 3 and, at that point, then-Executive Director Brenda Mercer had been on bereavement leave since September 7 following the death of her sister. There was no process to replace the director in September, at least not in any world where Matthew Glass had a say or a role. Following Mercer’s resignation, Glass asked Teresa Sander to find out the details on hiring a new executive director. On December 19, Sander forwarded Glass an email from Sen. Jim Luker regarding the position, and she noted, “Jim said to let you know this [position] will be a grade 19.” On December 22, Sander forwarded Glass an email from Latreasa Mullins, the Fiscal/HR Manager for the Health Services Permit Agency, which said, “also note the salary range, you can hire someone under the exceptional well qualified up to the MIDPOINT level, anything beyond midpoint will require legislature approval and justification.” There was no response from Glass to either of these emails that even suggested that he had “won approval” from Beebe for anything related to the salary. Then, on January 8, 2015, the appropriations bill for the Health Services Permit Agency (the designated state agency for the DDC) was filed by the Joint Budget Committee. In it, like in previous appropriations for that agency, there was no position of DCC Executive Director, only a Health Programs Specialist III, which the Executive Director had been traditionally slotted into. There was no change in salary range from the previous year, either; the position remained a C119, just as Sen. Luker had mentioned and just as Glass later stated to the Council during the February conference call. In fact, in that conference call, he specifically stated that he had “worked with Governor Beebe’s chief of staff and some other folks [to try to raise the salary, but] unfortunately, we ran out of time.” Running out of time before one succeeds is usually not considered “winning” anything. Well, what about Glass’s claim that there was “no pressure to hire Munson”? From mid-December 2014 to January 12, 2015, Glass sent emails regarding changing the positional requirements for the executive director’s position.2 These changes were completed by January 12, when Glass emailed Teresa Sander to make specific changes that he had made to a standard description for the position. His changes are visible here. On January 20, Glass told Sander that he was not ready to post the job opening because “we need the executive committee to approve job description changes.” He then cancelled an Executive Committee meeting scheduled for that same day. The next day, according to the mileage reimbursement forms that he submitted, on January 21, Glass drove to Little Rock for “Meetings with Legislature,” and, on January 26, he came back to Little Rock for “Meetings.”3 He then came back to Little Rock for more “Meetings” on February 8th and 9th, which was a weekend. On February 10th — e.g., the first work day after that last round of “Meetings” — Gov. Asa Hutchinson wrote a letter to the chairs of the Joint Budget Committee, requesting that they amend the appropriation for the Health Services Permit Agency. Specifically, the Governor asked that the C119 position of Health Programs Specialist III be deleted from the appropriations bill and that it be replaced with, “Exec Dir Dev Disabilities Council” at a flat salary of $90,000. Curiously, it was only after that February 18 meeting, once Glass had secured approval for hiring Eric Munson, that the Governor’s February 10th letter was acted upon by the Joint Budget Committee. It is unclear whether Hutchinson was sitting on the letter until Munson was approved, or whether the JBC was holding on to it for the same purpose, but given that Governor’s Letter #10 is dated February 23 and Governor’s Letter #16 is dated February 24, the fact that the February 10th letter is labeled as Governor’s Letter #15 suggests strongly that it was Hutchinson who held it until his guy was given the job. So, seriously, tell us again how there was no pressure to hire Eric Munson. The Governor’s February 10th letter went on to state, “The minimum requirements for the Executive Director will be substantially increased in order to attract a candidate who will be able to move the Developmental Disabilities Planning Council program forward and make it more competitive with other state agencies as well as other southeastern states” (emphasis added). Even if you ignore the fact that the DDC is not a true state agency and that the DDC is not really an entity that is in competition with “other southeastern states,” this statement is still confusing. After all, the minimum requirements for the position were hardly (let alone “substantially”) increased; they were literally decreased, as shown right here. Which actually brings us to another point of contention regarding Glass’s comments above. Glass stated that “proper procedures were followed” in the hiring of Eric Munson. Yet, despite Glass’s changing of the minimum requirements, and despite DDC bylaws that require any such change to be voted on by the Executive Committee of the DDC, as Glass noted in his January 20 email, no such vote was ever taken. 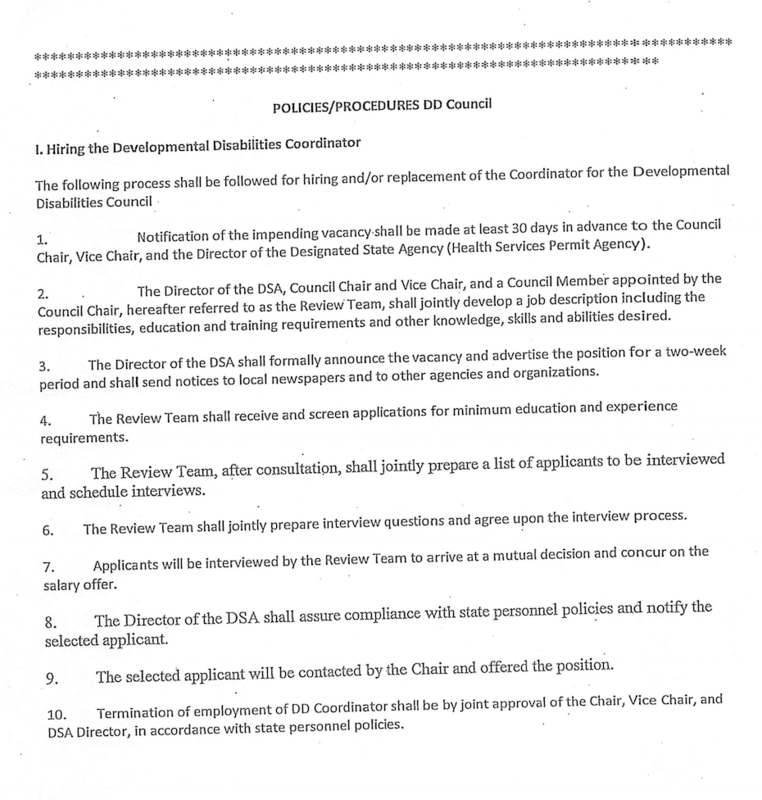 Additionally, the DDC Policies and Procedures explicitly state, “the Director of the [Health Services Permit Agency,] Council Chair and Vice Chair, and a Council Member appointed by the Council Chair…shall jointly develop a job description including the responsibilities, education and training requirements and other knowledge, skills and abilities desired.” That was absolutely not done here, by Glass’s own admissions in his emails. He alone changed the job description, without input from any of the other people who are tasked with that job. Then there is also the fact that Eric Munson was hired into the existing C119 position at $60,389.68.4 However, the midpoint salary for a C119 is $49,067. As Latreasa Mullins mentioned in her email to Teresa Sander, Munson could only be hired up to the midpoint amount without legislative approval and justification. Yet, no justification was ever given and, as far as anyone can tell, no legislative approval was sought or obtained for that hiring. All told, Glass’s comments to Max reek of someone scrambling to cover the fact that the Governor absolutely did interfere in the hiring of of the DDC’s executive director, in violation of federal rules, and that the person hired was done so outside of policy and without the proper qualifications or review. Worse, Glass’s comments demonstrate someone who is unaware that a papertrail exists and that the papertrail undermines nearly everything he hopes people will believe. Whether these missteps are enough to cost Glass is questionable, but, given that Glass kept everyone out of the loop for most of the hiring process, I would be shocked if the DDC does not take another look at Eric Munson. -When I sent a FOIA request specifically for the job qualifications for the executive director position, Munson responded with this document. Despite the qualifications having been changed months earlier, as shown in this document. That was not the only time he failed to properly respond to a FOIA request, but it was probably the most egregious, all things considered. -Munson has been on the job since, roughly, March 1. As a state employee, he accrues vacation time at the rate of one day per month. Meaning, as of June 1, he should have had three vacation days available. So how is it that he took two days’ worth of leave on April 23 and 24, then took two and a half more days of vacation (plus 18 hours of unpaid leave, plus 18 hours of sick time) for a vacation that started on May 28? Additionally, the statute is pretty clear that sick leave is not to be granted for “indisposition not incapacitating the employee for the performance of his or her regular duties,” so why was Munson allowed to use over two days of sick leave as part of his vacation? -Glass mentioned in his comments to Max that Munson’s position was not posted, but only because of the “emergency situation” the DDC was in. Except Gov. Hutchinson’s letter to the JBC specifically stated that the job requirements were being changed to “attract a candidate,” and Glass’s email to Sander said that the reason he was not ready to post the job opening was because the changes needed to be approved by the Executive Committee. Apparently, both of these statements were complete lies. -Under Arkansas law, the maximum amount for which a person may invoice the state for lodging while on state business in Little Rock is $89/night. Why is Glass staying at the Marriott for $220.60/night, then billing the state for that full amount? How is that acceptable? -Glass felt that I should have mentioned representing a former DDC employee. Except (a) that has no bearing on whether Munson was hired properly and (b) that “representation” was sending a couple emails for documents on behalf of my friend, since the employee’s grievance was never pursued. But, hey, whatever it takes to deflect a little heat, Matthew. But as long as we’re disclosing things, it might be of interest for people to know that Glass routinely closes Executive Council meetings, in violation of the open-meetings act, apparently because he does not understand the difference between Executive Council and an executive session under the FOIA. That is probably going to be a problem for the DDC going forward. Arkansas children & adults with disabilities stepped on again by those engaged or employed by the state to help.